Home theatre / family room professionally designed WSDG sound engineering studio and build by Harmony Home Projects Inc.
Home theatre / family room by Harmony Home Projects Inc. Designing and building your own home theatre can be a fun process whether you have experience in design and decorating or not. Your imagination, budget constraints and the space available are the only limits when it comes to designing and creating your ultimate home theatre (or recording studio) experience. The single most important component of any home theatre system is a room itself and its construction can become a complicated undertaking. Items such as construction methods and materials, HVAC, sound isolation, lighting, and electrical requirements, are all extremely important to achieving the acoustical quality of the room. If any of these elements are designed and implemented incorrectly, it becomes very expensive to fix the underlying issues. To avoid the costly mistakes in building a home theatre, we listed a few simple rules to help you build your private home theatre without a hitch. For the optimal viewing quality, if your theater room is not completely dark you may choose a rear projection LCD, DLP (also flat-panel LCDs, or Plasmas are all good choices for small home theaters) that produce very bright, high contrast images. Front projection LCD and DLP provide the optimum viewing quality in completely dark rooms and this may not be achievable in some cases of rooms designated for home theatres. Also include in your plan the acoustical sound absorbing panels. Home theatre room / family room - view of the ceiling panels. 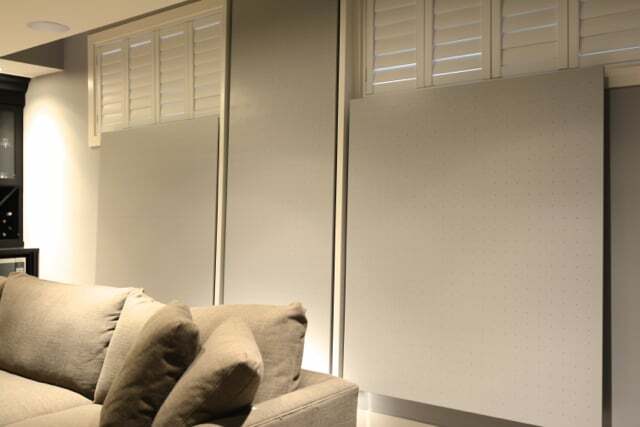 Home theatre room - custom made sound absorbing back wall panels. Home theatre / family room by Harmony Home Project Inc.
Home theatre room / family room - view of the mounting / architectural details. These few simple rules will help you build your private home theater for the optimal viewing experience. If you would like a consultation on your home theatre (or a home sound studio), email us at info@harmonyhomeprojects.ca to discuss your next home theatre project.